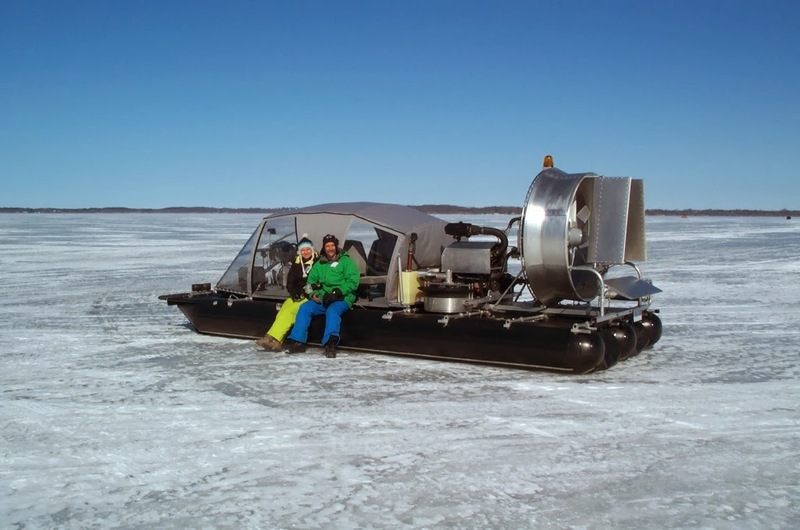 The design of all hovercraft is based on the principle of creating a cushion of air between the craft and the surface it's riding over, be it water, ice, or *flat* ground. The problem is that most hovercraft cannot float on their own, having no hull to displace water. This is why you always see a hovercraft landing on a beach before powering down. In cold regions, hovercraft are popular since they can perform in water in summer, and ice in winter, but the deficiency of the common design is that they cannot operate in rough water. Waves of modest height can break the air cushion seal the hovercraft needs to stay aloft. Leave it to the Canadian's to develop a design that overcomes this issue by adding pontoons to the skirt design. These inflatable pontoons not only form part of the cushion system, but provide buoyancy when stopped, at slow speeds, or in rough water. Because the air cushion only raises the craft 4cm, the pontoons must be able to take obstruction impacts, which is likely a problem when running on land since just like rough water, bumpy roads will break the air cushion as well. I'm sure it's not a perfect design, but boasting speeds of 90-120kph it is impressive. I don't think it would work well in southern swamp environments as the pontoons could easily become ensnared in plant material, airboats have flat bottoms and ride over, or mow down, anything in their way. There's more pics on the website including videos. I don't see images or video involving rough water, but it appears to scoot across the ice rather nicely. Well done.